After getting such a big response from that sleeveless stripe dress that I thrifted this weekend, I thought I'd do a little more research on the designer who, it turns out, was a well-known name in the '50s and '60s: Anne Fogarty. According to the Fashion Encyclopedia, Fogarty was born Anne Whitney on Feb. 2, 1919 in Pittsburgh. She grew up to study drama at the Carnegie Institute of Technology in the late '30s, where her love of costume is what set in motion her design career. After college, Fogarty went to work for Harvey Berin as a fitting model, and he encouraged her to think about a career in styling. Left image source; right image source. In the late '40s, she began designing clothes for Youth Guild, a brand marketed to teenagers that made clothing in the "New Look," which was narrow waists and full skirts. In the early '50s Fogarty moved on to Margot, Inc., which designed clothing for juniors, and continued to produced garments in that "paper doll" silhouette (fitted bodice, narrow waist and full skirt), but now incorporated the crinoline petticoats, made popular in the Edwardian era, to make the skirt fuller and exaggerate the appearance of a narrow waistline. 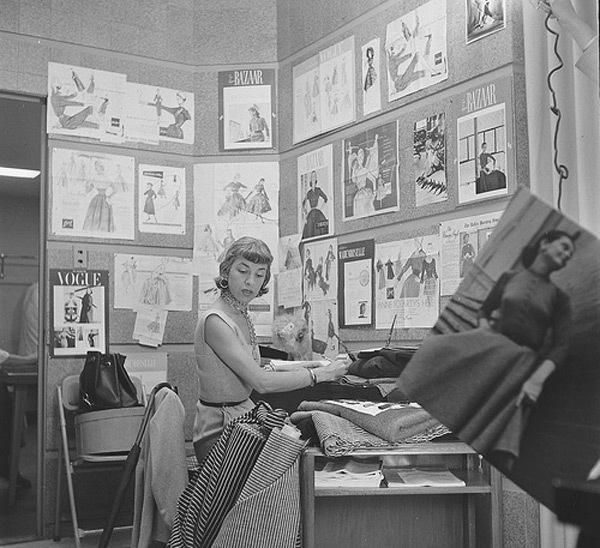 In the late '50s Fogarty became a designer for Saks Fifth Avenue, then opened her own business, Anne Fogarty Inc., in the early '60s, adding misses sizes to her clothing lines and expanding the depth of her designs. She also produced collections under the names A.F. Boutique (which is what the stripe dress comes from), Clothes Circuit and Collector's Items. 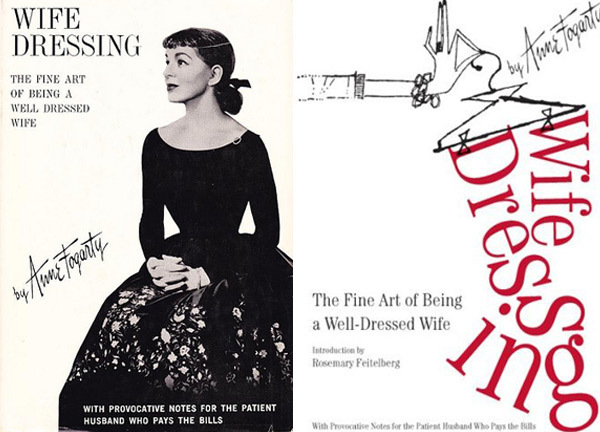 She wrote a book in 1959 titled Wife Dressing: The Fine Art of Being a Well-Dressed Wife, which has become a must-read style guide for "the art of looking chic on any occasion," and surely one for any lover of vintage. SO...I thought since we haven't had a giveaway in a while, this would be the perfect opportunity! I'll be giving away one copy of the 2008 edition to one lucky reader! And, since shipping books is a breeze, this giveaway is open to U.S. and international readers (yipee!). EEEEK! Fun giveaway! I'm a child of the 80's. Totally devoted. 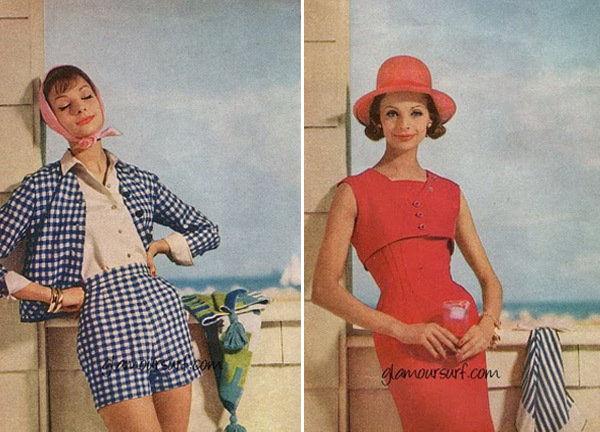 I absolutely love the 'look' of the 50's....just so pretty in every way...from the fabrics to the detailing!! I loved that striped dress and am so grateful for the vintage label/designer information - thank you! Really tough to pick just one era, but when thrifting items for myself or my home I tend to go with the early 70's boho/prairie look. Of course, I'm a sucker for any vintage... no matter what era! It's the Mad Men thing all the way for me - like me to tell you why? 1. because I was a really little girl in the early 60s and my mum and grandmother were sooooo glamorous, so I've grown up thinking that heels, big hair, eyeliner, pencil skirts, are Just The Thing. 2. Baby, I've got the shape to fill these clothes out just right! I would have to say the 60's. I love the bright color palette... and in my opinion everything that Twiggy wears turns to gold! There are things I like from all of the eras before I was born. Edwardian hats, Art deco jewelry, the hairstyles of WWII, the ladylike dresses of the post-war years, and the simple sheath dresses of the 60s. The 70s and 80s leave me a bit cold, probably because you can't really go back and wear what you wore in your youth, although the whole preppy thing from the 80s translates easily since it was mostly classics. I think I like something from every era but the simple, sleekness of the 50's is on of my favorites. I have a book called Teen Age Glamour that teaches young girls how to groom themselves. Published in 1948 I think. Cool find! 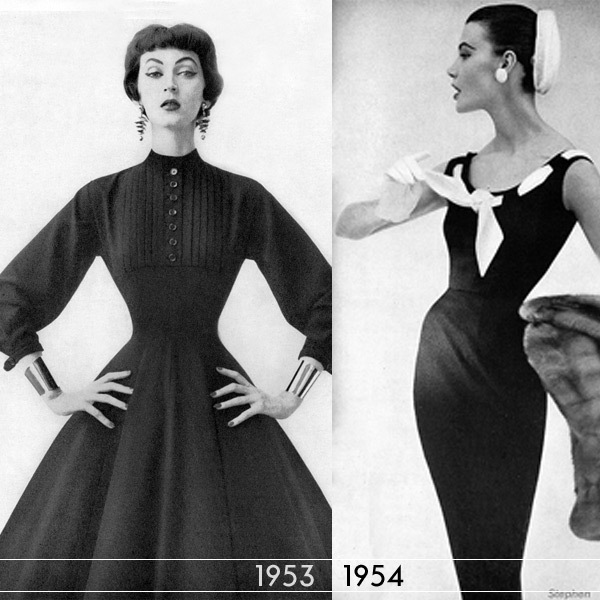 I love the curvy lines of the 50s and early 60s. I got married in a vintage red wiggle dress! I love the late fifties/early sixties silhouettes. I love the glamour of the 50's! Vintage fashions are beautiful! Great find.